Tammam Azzam was recently part of FUU 2015, the first Sarajevo Street Art Festival held on 25 to 27 September in twenty different locations throughout the Bosnian capital. The festival’s zero edition gathered both established as well as new artists under the theme Unknown Transformation - Looking at Sarajevo from Another Perspective, with the aim to bring the city’s art community to the forefront. Showcasing various facets of visual arts—from graffiti to murals, FUU brought the facades of the city’s buildings to life. 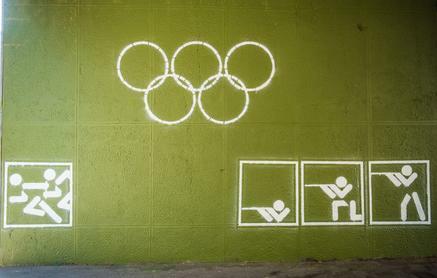 Azzam was featured with Syrian Olympics, originally a digital work that illustrates the logo for the Olympic games with five figures underneath it— two of them running while the other three shoot at them. For the occasion, the image was enlarged and stencilled onto one of the city’s walls.